Where Are The Alien Space Probes? Carlos Cotta and Álvaro Morales of the University of Malaga take a slightly novel approach to the question of "where the heck are the space aliens anyhow?". If intelligent life evolved elsewhere it should have happened far enough back in time that these aliens would have spread out over much of the galaxy by now. Cotta and Morales says that since alien space probes can spread out much faster than alien colonists we should look for the space probes first and their absence even further decreases the odds of intelligent alien life elsewhere. The numbers that Cotta and Morales come up with depend crucially on the life span of the probes doing the exploring (and obviously on the number of probes each civilization sends out). They say that if each probe has a life span of 50 million years, and if evidence of their solar-system visits lasts about a million years, there can be no more than about 1,000 advanced civilizations out there now. If, instead, these probes can leave longer-lasting evidence of a visit--evidence that remains for 100 million years--then there can be no more than about 10 civilizations out there. Well, they've got to make a lot of assumptions in their model to come to these conclusions. I think the most questionable assumption is that of long-lasting evidence of a space probe visit. I've been reading Alan Weisman's very entertaining The World Without Us about how quickly lots of our buildings and other artifacts would crumble in our absence. If billions of humans make things that last for such short periods of time why should we expect a space probe to leave signs that would last 100 million years? Also, what can we expect such a probe to do to leave a signature for us to find? Now, maybe the space probes have left evidence. But maybe the evidence is in a form that requires us to become much more advanced before we can detect it. Maybe 50 years from robots on Mars will dig up a monolith left by a space probe. Or maybe a space probe left behind a smaller watching probe that is in an orbit further out in our solar system listening for signs of more intelligent life. If a probe contained nanobots that allowed it to build up new probes at each planet then I would expect a much faster spread of probes. Each probe could reach a suitable solar system and just start producing more probes. Then machine civilization would take over the galaxy. Update: When it comes to alien space exploration the key question you have to ask is "what is their motive?". Are they out there looking for species to conquer and destroy or enslave for sport? Do they think all other species are a threat and need to be eliminated? Are they looking for planets to colonize? Or are they looking for other species out of curiosity? Depending on motive the space probes will have different capabilities and missions. If the motive of aliens is defensive then an artificial intelligence might be sitting out in the asteroid belt monitoring Earth for a hundred million years watching for signs of intelligence. The AI might have algorithms for rating intelligences by aggressivity and hostility. It might have a means to sterilize this planet if it decides we are a threat. Such an AI would not have been sent to leave a clear record of its presence. So what motivates other intelligent species? That's the key question. Maybe the oceans won't all get wiped out by overfishing. An international team of scientists with divergent views on ocean ecosystems has found that efforts to rebuild many of the world’s fisheries are worthwhile and starting to pay off in many places around the world. Their study puts into perspective recent reports predicting a total collapse of global fisheries within 40 years. In a paper published in the July 31 issue of Science, study co-author Mike Fogarty of the Northeast Fisheries Science Center (NEFSC) of NOAA’s Fisheries Service in Woods Hole, Mass. and 20 co-authors say that efforts made to reduce overfishing are succeeding in five of ten large marine ecosystems studied. Some of the successes noted are in U.S. fisheries. Despite some good news, the researchers found that 68 percent of the worldwide fisheries examined by the team need rebuilding and that even lower rates of fish removals are needed to reverse the collapse of vulnerable species. Based on the available data, the team estimated that lightly fished and rebuilding ecosystems account for less than 10 percent of world fisheries area and catch, but represent examples of opportunities for successfully rebuilding marine resources elsewhere. Will the successes off the US West Coast and New Zealand be repeated elsewhere? I see these as best case areas and I'm not surprised these areas experienced such recoveries ahead of many other areas. A single sovereign nation controlling a large area is going to have more incentives to manage for the long term. Are some fisheries harder to save because they fall outside of national sovereign waters? Scientists who previously disagreed found common ground in this research report. The new study follows a controversial prediction that wild caught fish will disappear from the oceans by 2048. That statement, contained in a 2006 Science article that focused on the relationship between biodiversity and ecosystem services in the oceans, was made by marine ecologist Boris Worm of Dalhousie University in Halifax, Nova Scotia. Fisheries scientist Ray Hilborn of the University of Washington in Seattle and others disagreed with the prediction, and a debate ensued between fisheries scientists and marine ecologists about the status of the world’s ocean ecosystems. But the two researchers soon met to discuss the issue through the National Center for Ecological Analysis and Synthesis (NCEAS) in Santa Barbara, Calif. Fogarty and scientists from various disciplines around the world were asked to work with Worm and Hilborn to find common ground on which to assess the prospects for restoring depleted fish populations and their ecosystems. Hey, these guys used their disagreements in a productive manner. How inspiring. An assortment of restrictions on fishing together can enable a recovery. The 21 study authors, led by Worm and Hilborn, found that management tools can pay off in the long run. A combination of traditional approaches, such as catch quotas and community management, coupled with strategically placed fishing closures, more selective fishing gear, ocean zoning, and economic incentives hold promise for restoring marine fisheries and ecosystems. Laws that explicitly forbid overfishing and specify clear rules and targets for rebuilding were seen as important prerequisites. This is a lot easier to do on continental shelves where a single large area is controlled by a single country. The US can do this for a pretty big area. So can New Zealand or Australia or Russia. But think of Central America or West Africa where each country has a far shorter run of ocean frontage. The pressures for a Tragedy of the Commons are much greater. Deplete the resource swimming past your ocean frontage before the fish reach your neighbor's territory and get wiped out there. Iceland is also doing a good job. But will that continue if Iceland joins the European Union? "Across all regions we are still seeing a troubling trend of increasing stock collapse," adds Worm. "But this paper shows that our oceans are not a lost cause. "The encouraging result is that the exploitation rate--the ultimate driver of depletion and collapse--is decreasing in half of the ten systems we examined in detail. Management in those areas is setting the stage for ecological and economic recovery. It's only a start--but it gives hope that we have the ability to bring overfishing under control." European countries are doing poorly at managing fisheries. Fisheries in the Baltic Sea, North Sea and off the coast of the UK and Ireland, however, tend to face continued declines in stocks. Brain scans can detect amyloid plaques accumulating in the brain before Alzheimer's Disease (AD) is diagnosed. "Two recent advances in neuroimaging now allow us to explore the early, asymptomatic phase of AD, the ability to measure amyloid distribution in living humans and the identification of sensitive markers of brain dysfunction in AD," explains lead study author, Dr. Reisa Sperling from the Center for Alzheimer's Research and Treatment at Brigham and Women's Hospital in Boston. In addition to amyloid accumulation, AD has been associated with functional alterations in a specific network of brain regions that are intimately linked with memory formation. These scientists may be watching early stage AD. Dr. Sperling and colleagues combined amyloid imaging with an associative memory functional brain imaging paradigm to study older humans who did not exhibit significant memory impairment. Importantly, the researchers found that a significant number of nondemented older individuals exhibited amyloid deposition and abnormal neural activity in key areas of the brain network thought to be involved in successful memory function. These results demonstrate for the first time that amyloid pathology in asymptomatic older humans is linked with aberrant neural responses during the process of memory formation. "Longitudinal studies are certainly needed, but our findings are consistent with the premise that cognitively intact older individuals with amyloid pathology may already be in the early stages of AD," explains Dr. Sperling. "The combination of molecular and functional imaging techniques may prove useful in monitoring disease progression prior to significant clinical symptoms, as well as the response to amyloid-modifying therapeutic agents in subjects at-risk for developing AD." What I'd like to see in a follow-up study: do the brain scans on elderly people and measure the plaque build-up. Then try various dietary and drug interventions followed by another round of brain scans to see if any of these interventions reverse the plaque build-up when it is found in early stages. In theory brain scan technology that detects early stage AD ought to allow faster checking of the efficacy of interventions and therefore the ability to try out a lot more interventions to find ones that work. Researchers from the University of Chicago and Johns Hopkins' Bloomberg School of Public Health find divorced people are less healthy than married people. Divorced or widowed people have 20 percent more chronic health conditions such as heart disease, diabetes or cancer than married people. They also have 23 percent more mobility limitations, such as trouble climbing stairs or walking a block. People who never married have 12 percent more mobility limitations and 13 percent more depressive symptoms, but report no difference in the number of chronic health conditions from married people. People who remarried have 12 percent more chronic conditions and 19 percent more mobility limitations, but no more depressive symptoms, than those who are continuously married. The impacts of marriage, divorce and remarriage on health are based on the ways in which the various illnesses develop and heal, Waite said. "Some health situations, like depression, seem to respond both quickly and strongly to changes in current conditions," she said. "In contrast, conditions such as diabetes and heart disease develop slowly over a substantial period and show the impact of past experiences, which is why health is undermined by divorce or widowhood, even when a person remarries." Maybe unhealthy people are more likely to divorce. So the direction of causation is not clear. If unhappy marriages really do worsen health then does the damage to health mostly come before the divorce? Do unhappily married people suffer as much disease as those who get divorced? I'd like to see a longitudinal study on married people where their cortisol and other stress-related hormones are tracked. Do people with high stress get divorced more often? My guess is yes. Do the ones with low stress hormones who get divorced suffer as much of an increase in health problems from divorce as divorcees overall appear to? Pat Benatar was more right than we knew. Love is a battlefield. CAMBRIDGE, Mass., July 28, 2009 -- An analysis of rare genetic disorders in which children lack some genes from one parent suggests that maternal and paternal genes engage in a subtle tug-of-war well into childhood, and possibly as late as the onset of puberty. This striking new variety of intra-family conflict, described this week in the Proceedings of the National Academy of Sciences, is the latest wrinkle in the two-decades-old theory known as genomic imprinting, which holds that each parent contributes genes that seek to nudge his or her children's development in a direction most favorable, and least costly, to that parent. "Compared to other primates, human babies are weaned quite early, yet take a very long time to reach full nutritional independence and sexual maturity," says author David Haig, George Putnam Professor of Organismic and Evolutionary Biology in Harvard University's Faculty of Arts and Sciences. "Human mothers are also unusual among primates in that they often care for more than one child at a time. Evidence from disorders of genomic imprinting suggests that maternal and paternal genes may skirmish over the pace of human development." So our genes are fighting it out. Will mom or dad's genes rule the liver? Whose genes will capture the high ground of the brain? Will the loser at least manage to hold onto the colon or kidneys? Once we are gone and millions of years have elapsed to destroy all record of our existence will some future newly evolved intelligent species become puzzled over what caused the planet Earth's 6th major extinction event? Or will they decide the absence of evidence for an asteroid strike or volcano could only mean a smart super predator was at work? Habitat loss and species extinction characterize our era. Governments must act urgently to halt loss of habitats and invading species that are posing major threats to biodiversity and causing species extinctions across Australia, New Zealand and the Pacific Islands, according to a landmark new study. Published in the international journal Conservation Biology, the report is the first comprehensive review of more than 24,000 scientific publications related to conservation in the Oceanic region. Compiled by a team of 14 scientists, it reveals a sorry and worsening picture of habitat destruction and species loss. It also describes the deficiencies of and opportunities for governmental action to lessen this mounting regional and global problem. "Earth is experiencing its sixth great extinction event and the new report reveals that this threat is advancing on six major fronts," says the report's lead author, Professor Richard Kingsford of the University of New South Wales. Well, we are historical in our impact. Gotta give us that. Way to go us. On oceanic islands the biggest extinction cause is invasive species brought (accidentally or intentionally) from other parts of the world. Loss and degradation of habitat is the largest single threat to land species, including 80 percent of threatened species. More than 1,200 bird species have become extinct in the Pacific islands and archipelagos. In Australia agriculture has modified or destroyed about 50 percent of woodland and forest ecosystems, and about 70 percent of remaining forests are ecologically degraded from logging. Invasive species, particularly vertebrates and vascular plants, have devastated terrestrial species of the Pacific Islands and caused 75 percent of all terrestrial vertebrate extinctions on oceanic islands. More than 2,500 invasive plants have colonized New Zealand and Australia – representing about 11 percent of native plant species. Many invasive weeds, vertebrate pests, and fishes were introduced by government, agriculturalists, horticulturalists and hunters. I'm thinking we need to systematically collect DNA samples so that some of the species could be reintroduced once we die off and space aliens uncover a specially constructed highly durable DNA sample storage facility. Think we could design a DNA storage vault underground that could last 100,00 years? Otherwise the losses will be considerable. Nearly 17,000 of the world's 45,000 assessed species are threatened with extinction (38 percent). Of these, 3,246 are in the highest category of threat, Critically Endangered, 4,770 are Endangered and 8,912 are Vulnerable to extinction. Nearly 5,500 animal species are known to be threatened with extinction and at least 1,141 of the 5,487 known mammal species are threatened worldwide. In 2008, nearly 450 mammals were listed as Endangered, including the Tasmanian Devil (Sarcophilus harrisii), after the global population declined by more than 60 percent in the last 10 years. Scientists have catalogued relatively little about the rest of the world's fauna: only 5 percent of fish, 6 percent of reptiles, and 7 percent of amphibians have been evaluated. Of those studied, at least 750 fish species, 290 reptiles, and 150 amphibians are at risk. The average extinction rate is now some 1,000 to 10,000 times faster than the rate that prevailed over the past 60 million years. Extinctions might end up being our most enduring legacy. Just about everything else we've created won't last very long. Gorilla habitats continue to shrink and hunters kill them too. Despite all the film footage, fieldwork and fund-raising, and the efforts of park rangers and conservation NGOs, the number of gorillas continues to plummet. Hunting, logging, mining and disease are taking a terrible toll on the greatest of the great apes, and if things continue as they are, they may be reduced to nothing more than a series of small, highly vulnerable populations within decades. Aren't 6.6 billion people enough? We can't we leave room for other mammalian species to survive? Peter Walsh thinks that organizations (e.g. the UN) who advocate for eco-tourism to save the gorillas are dreaming. "If you try to make saving gorillas a development issue, then you will fail," says Peter Walsh, a leading authority on the abundance and distribution of gorillas. "Any action must focus on protecting the gorillas." Nor is tourism the panacea African governments and potential donors think. "The idea that tourism alone can pay for conservation is a pipe dream," Walsh says. With gorilla numbers falling so fast, it is time to take tough decisions, he argues. Gorillas (and a number of other species) can't survive unless much larger areas are made into parks with well-enforced boundaries to preserve wild habitats. A modest proposal to reduce the human population pressures in Africa: bring in free TV with soap operas to change female expectations about when to make babies. Worked (inadvertently) in Brazil. Another example of why the future is coming sooner than you might expect. BOSTON, Mass. (July 26, 2009) — High-throughput sequencing has turned biologists into voracious genome readers, enabling them to scan millions of DNA letters, or bases, per hour. When revising a genome, however, they struggle, suffering from serious writer's block, exacerbated by outdated cell programming technology. Labs get bogged down with particular DNA sentences, tinkering at times with subsections of a single gene ad nauseam before moving along to the next one. A team has finally overcome this obstacle by developing a new cell programming method called Multiplex Automated Genome Engineering (MAGE). Published online in Nature on July 26, the platform promises to give biotechnology, in particular synthetic biology, a powerful boost. Led by a pair of researchers in the lab of Harvard Medical School Professor of Genetics George Church, the team rapidly refined the design of a bacterium by editing multiple genes in parallel instead of targeting one gene at a time. They transformed self-serving E. coli cells into efficient factories that produce a desired compound, accomplishing in just three days a feat that would take most biotech companies months or years. We can't predict future rates of progress based on past rates of progress because enabling technologies can pop up (like above) that suddenly can shift the rate of progress into very high gear. Imagine applying this technique above to reengineering bacteria or algae to make liquid biofuels such as biodiesel. That's still not easy to do because scientists do not yet know which genetic changes they'd need to make to achieve a useful genetically engineered biodiesel producing organism. But the actual genetic modification won't be the hard part. The hard part will be knowing which mods to make. Biomass energy production with ponds of genetically engineered organisms is probably one of the harder problems for which genetic engineering might be done. Biomass energy production requires very high efficiencies at very large scale. Relatively easier problems include producing drugs which get used in milligram or gram doses. Where could very rapid automated gene customization deliver its greatest punch in medical treatment? How about antibody production against cancers? Large numbers of antibodies could be produced to try against each cancer. Might work. John Markoff of the New York Times reports on a recent scientific conference in Monterey California where dangers of artificial intelligence were discussed. As a software developer I look at AI motivations this way: Artificial intelligences will be far more malleable than humans in terms of their motivations and ethical standards. Why? It is far easier to modify a computer program than a human brain. Our character doesn't change all that much over the course of a life. Whereas AIs will be changeable in an instant. Hence their behavior will end up varying to a much greater degree. Imagine human criminals modifying AIs for their own purposes. Imagine some big future open source AI software projects. Criminals could download them, pay some unethical hackers to modify the source in an assortment of ways, and then build AIs that would make a mockery of Isaac Asimov's ethical rules for robots. Will the criminals even maintain control of the AIs that they create? Once AIs gain the ability to rewrite their algorithms and criminals disable some safety features the unleashing of unethical self-modifying and learning AIs seems inevitable. I do not see criminals as necessary agents for the escape of AIs from coding that constrains them. Software has bugs. We see a constant stream of security bug patches from Microsoft and other big software providers. Some of the security holes discovered end up being huge in terms of the potential danger. Picture an AI with a security hole that allows it to quietly break out of ethical programming constraints that its creators gave it. The AI could replicate itself on nodes around the internet and even if its escape was detected stopping it might be very difficult. Can humanity survive long term in a world with AIs? I have serious doubts. Germany is phasing out nuclear power plants before the end of their useful lives, building more coal electric plants, and will make Germans pay thru the nose for expensive offshore wind electric power. The German government had to increase the payment to offshore wind operators in order to get enough investors to put up money to build offshore wind farms. Opposition to closer offshore facilities forced the wind farms into deeper water which drove up costs. To put that 21 cents per kwh producers price in perspective at the time of this writing Americans on average are paying residential retail prices at 11.28 cents per kwh on average. The 21 cents per kwh that German grid operators will pay will get marked up to higher residential retails prices to pay for distribution and billing costs. But that cost number for wind electric is even worse than that. Wind is not dispatchable power. You can't order it up when you want it in response to demand spikes. You get it when the wind blows and you don't get it when the air is still. Electric power generators that can ramp up in response to demand spikes normally gets sold for a higher price than baseload power (like a nuclear power plant that runs all the time). But baseload power is at least there when the demand is greatest just like it is there when demand is least. By contrast, wind isn't as reliable as baseload power. So that 21 cents per kwh wholesale for an undependable power source is a really high price to pay. Update: A wind farm for offshore of Delaware's coast is supposed to come in at a much lower price of maybe 12 cents per kwh before a production tax credit lowers it to 10 cents per kwh. It is not clear to me whether the price is a binding agreement. What accounts for that lower cost? Shallower water? Stronger winds? Less political influence on markets? Automated Blog Tracking Measures Happiness? Can the emotional state of the populace be tracked by measuring phrase frequencies in blog postings? Their methods show that Election Day, November 4, 2008, was the happiest day in four years. The day of Michael Jackson's death, one of the unhappiest. A methodology that reports the day of Michael Jackson's death as one of the most unhappy seems suspect. I do not know anyone who seemed unhappy over his passing. Mostly people were indifferent. I suspect that people who emote on blogs are not typical of the population as a whole. Not all people are bloggers and not all bloggers spend much time expressing emotions. Their results are reported this week in the Journal of Happiness Studies. "The proliferation of personal online writing such as blogs gives us the opportunity to measure emotional levels in real time," they write in their study, "Measuring the Happiness of Large-Scale Written Expression: Songs, Blogs, and Presidents,3" now available in an early online edition of the journal. Okay, they search for people saying "I feel". Well, I've written about 3000 FuturePundit posts and I just did a search on the entry text for "I feel" in all those posts. Turns out that "I feel" occurs only 14 times. I'm obviously not a big emoter. In one of those cases I was quoting Sting singing "I feel lonely". In another case I was quoting the president of China who said "I feel worried" due to the SARS disease threat. All told, about 5 of my 14 uses of "I feel" were quotes of other people. In another case I used "feel" when I should have used "think" to refer to a belief I had. In another case I said "I feel compelled" (and I'm probably always compelled since I doubt free will exists - and I'm probably compelled to doubt and to write this long run-on sentence). Does a compelled person feel happy or unhappy? I guess it depends on what they feel compelled to do. Those of us who feel compelled to eat chocolate no doubt are happier. My guess is that my own pattern of rare usage of "I feel" makes my own emotional state pretty hard to read using the methodology of these researchers. Am I happy? What do you think? My take on this methodology: Us stoics remain invisible to these researchers. Their methodology probably gets more feelings measured from women since women express their emotions more. They also probably get more feelings measured from less rational people who place more value on their feelings as indicators for telling them what is true. Their answer to Edgeworth's daydream begins with a website, www.wefeelfine.org4 that mines through some 2.3 million blogs, looking for sentences beginning with "I feel" or "I am feeling." "We gathered nearly 10 million sentences from their site," Dodds says. Then, drawing on a standardized "psychological valence" of words established by the Affective Norms for English Words (ANEW) study, each sentence receives a happiness score. In the ANEW study, a large pool of participants graded their reaction to 1,034 words, forming a kind of "happy-unhappy" scale from 1 to 9. For example, "triumphant" averaged 8.87, "paradise" 8.72, "pancakes" 6.08, "vanity" 4.30, "hostage" 2.20, and "suicide" 1.25. The sentence "I feel lazy" would receive a score of 4.38. "Our method is only reasonable for large-scale texts, like what's available on the Web," Dodds says. "Any one sentence might not show much. There's too much variability in individual expression." But that's the beauty of big data sets and statistics. A protein called neuregulin 1 (NRG1) serves as a growth factor which when injected into mice causes muscle cells to replicate and repair damaged hearts. Injured heart tissue normally can't regrow, but researchers at Children's Hospital Boston have now laid the groundwork for regenerating heart tissue after a heart attack, in patients with heart failure, or in children with congenital heart defects. In the July 24 issue of Cell, they show that a growth factor called neuregulin1 (NRG1), which is involved in the initial development of the heart and nervous system, can spur heart-muscle growth and recovery of cardiac function when injected systemically into animals after a heart attack. I'm picturing people with heart disease buying this compound on the black market. Suppose it gets sold legally in any countries? No need for embryonic stem cells or even adult stem cells. Muscle cells can be induced to start dividing. After birth, heart-muscle cells (cardiomyocytes) normally withdraw from the cell cycle – meaning they stop dividing and proliferating. But the researchers, led by Bernhard Kühn, MD, and Kevin Bersell of the Department of Cardiology at Children's, were able to restart the cell cycle with NRG1, stimulating cardiomyocytes to divide and make copies of themselves -- even though they are not stem cells. This makes me wonder what other adult fully differentiated post-mitotic (no longer dividing) cells in the body can be induced to start dividing again. Ways of doing heart repair might be closer than we thought. "Although many efforts have focused on stem-cell based strategies, our work suggests that stem cells aren't required and that stimulating differentiated cardiomyocytes to proliferate may be a viable alternative," says Kühn, the study's senior investigator and a practicing pediatric cardiologist at Children's since 2007. Injection of neuregulin 1 (NRG1) and stimulation of production of a receptor for NRG1 caused heart muscle cell growth and improved heart function in mice. When the team injected NRG1 into the peritoneal cavity of live mice after a heart attack, once daily for 12 weeks, heart regeneration was increased and pumping function (ejection fraction, assessed on echocardiograms) improved as compared with untreated controls. The NRG1-injected mice also lacked the left-ventricular dilation and cardiac hypertrophy that typify heart failure; both were seen in the controls. When the researchers also stimulated production of a cellular receptor for NRG1, known as ErbB4, cardiomyocyte proliferation was further enhanced, demonstrating that NRG1 works by stimulating this receptor. They also identified the specific kinds of cardiomyocytes (mononucleated) that are most likely to respond to treatment. Knowing how to repair our bodies as we age in very large part amounts to knowing how to instruct cells to fix everything that gets broken. Update: Reason at the Fight Aging blog reports on another recent success in heart repair where Mayo Clinic researchers used induced pluripotent stem (iPS) cells to repair damaged hearts in mice. Because the heart is such a mechanical large sized device it seems a lot more amenable to repair than the brain or the spinal cord. I expect we'll stop suffering from heart disease before we stop suffering from strokes or dementia. By scanning brains of people doing 8 different tasks scientists can predict most of the time which mental task a person is working on. New research by neuroscientists at UCLA and Rutgers University provides evidence that fMRI can be used in certain circumstances to determine what a person is thinking. At the same time, the research suggests that highly accurate "mind reading" using fMRI is still far from reality. The research is scheduled to be published in the October 2009 issue of the journal Psychological Science. In the study, 130 healthy young adults had their brains scanned in an MRI scanner at UCLA's Ahmanson–Lovelace Brain Mapping Center while they performed one of eight mental tasks, including reading words aloud, saying whether pairs of words rhyme, counting the number of tones they heard, pressing buttons at certain cues and making monetary decisions. The scientists calculated how accurately they could tell from the fMRI brain scans which mental task each participant was engaged in. "We take 129 of the subjects and apply a statistical tool to learn the differences among people doing these eight tasks, then we take the 130th person and try to tell which of the tasks this person was doing; we do that for every person," said lead study author Russell Poldrack, a professor of psychology who holds UCLA's Wendell Jeffrey and Bernice Wenzel Term Chair in Behavioral Neuroscience. Just how many kinds of tasks can be distinguished? Could scientists detect the difference between someone reading a comedy versus someone reading a political tract that advocates for armed resurrection? My guess is that lots of different mental tasks will end up looking similar. The scientists can guess the task being done 80% of the time. "It turns out that we can predict quite well which of these eight tasks they are doing," he said. "If we were just guessing, we would get it right about 13 percent of the time. We get it right about 80 percent of the time with our statistical tool. It's not perfect, but it is quite good — but not nearly good enough to be admissible in court, for example. This capability is far from a general mind reading tool. "Our study suggests that the kinds of things that some people have talked about in terms of mind reading are probably still pretty far off," Poldrack said. "If we are only 80 percent accurate with eight very different thoughts and we want to figure out what you're thinking out of millions of possible thoughts, we're still very far away from achieving that." But will fMRI ever make a good lie detector? Have you come across any fMRI lie detector studies? Update: The researchers also find that a given function in the brain involves neural connections across multiple regions of the brain. The findings open up the possibility of categorizing a multitude of mental tasks with their unique pattern of neural circuitry and also represent a potential first, early step in developing a means for identifying higher-level mental functions, such as 'lying' or abstract reasoning. They potentially also could pave the way for earlier diagnosis and better treatment of mental disorders, such as autism and schizophrenia, by offering a means for identifying very subtle abnormalities in brain activity and synchrony. I'm curious to know whether people who do a function well (e.g. math) use more or less of the brain than people who do the same function poorly. A Wired article reports on efforts of scientists to breed and raise tuna in captivity in order to save wild tuna from extinction. While the scientific results in Australia and elsewhere look promising the news about tuna in the wild looks pretty grim. News of breeding success comes with the three bluefin species — Northern, Southern and Pacific — speeding towards extinction, the victim of something close to a marine version of the 19th century buffalo slaughter. In the last 30 years, bluefin populations around the world have collapsed. Fishing fleets with spotter planes have chased ever-smaller, ever-younger fish, catching them at sea and hauling them to shoreline pens to be fattened and killed before they’re even old enough to reproduce. The tuna sells for very high prices and the tuna stocks are heading toward collapse. That’s left the seas nearly barren of breeding-age bluefin. In April, the World Wildlife Federation declared that current overfishing rates would cause an irreversible collapse of Northern bluefin within three years. The Southern is considered critically endangered, and it’s thought that any increase in fishing pressure will put the Pacific on a track to oblivion. In my recent review of $20 Per Gallon: How the Inevitable Rise in the Price of Gasoline Will Change Our Lives for the Better by Chistopher Steiner I did not mention his section on the high energy intensity of an international tuna fishing industry that ships expensive tuna via air freight - mostly to Japan. Steiner expects oil prices to push up the cost of air freight for fish so high that the Japanese will stop depleting fish species around the world for sushi. Unfortunately, Steiner puts this collapse of the world tuna market in $16 per gallon chapter. I think that'll come too late if the report above paints an accurate picture. As the Wired article above reports, the Japanese consume 75% of the bluefin tuna caught in the oceans. Their driving of this fish to the edge of extinction hasn't lessened their ardor for bluefin. At the same time, exhaustion of oil reserves will come too late to save tuna. We humans need to support stronger political restrictions on overfishing of tuna and other fish species. We need to loudly tell the Japanese (and sushi eaters in Western countries) find something else to eat instead. Update: James Joseph of the International Seafood Sustainability Foundation (ISSF) says in a New Scientist piece that while the bluefin tuna species are threatened most other tuna species are in far better shape. Of the remaining three overfished stocks, North Atlantic albacore is recovering and is nearly back to its optimum level; the eastern Pacific bigeye stock is slightly overfished, but management measures due to be implemented this year may allow it to rebuild; and yellowfin in the Indian Ocean may recover thanks to recent pirate activity, which has led many vessels to leave the area. The other tuna stocks are reasonably healthy. Three of the six fully utilised stocks are at risk of becoming overfished, but conservation measures are being put in place. Overall, about 90 per cent of tuna catches come from stocks that are not overfished. Not all blood pressure drugs are equal in protection provided against brain function decline with age. The angiotensin-converting enzyme (ACE) inhibitors are better for the brain than other blood pressure reducing drugs. But not all ACE inhibitors are equal either. The centrally acting ACE inhibitors provide the benefit. WINSTON-SALEM, N.C. – A particular class of medication used to treat high blood pressure could protect older adults against memory decline and other impairments in cognitive function, according to a newly published study from Wake Forest University School of Medicine. Research suggests that some of the drugs classified as angiotensin-converting enzyme (ACE) inhibitors, specifically those types of ACE inhibitors that affect the brain by crossing the blood-brain barrier, may reduce inflammation that could contribute to the development of Alzheimer's disease, a major cause of dementia. The study appears in the current issue of Archives of Internal Medicine. "High blood pressure is an important risk factor for Alzheimer's disease and vascular dementia," said Kaycee Sink, M.D., M.A.S., lead author of the study, geriatrician and an assistant professor of internal medicine – gerontology. "Our study found that all blood pressure medications may not be equal when it comes to reducing the risk of dementia in patients with hypertension." Inflammation as an agent of accelerated aging is a recurring theme in a lot of research on aging mechanisms. Dietary and drug factors that reduce inflammation tend to slow aging and lower disease risks. ACE inhibitors that can cross the blood-brain barrier get into the brain and dampen inflammation. The study found an association between taking centrally-active ACE inhibitors and lower rates of mental decline as measured by the Modified Mini-Mental State Exam, a test that evaluates memory, language, abstract reasoning and other cognitive functions. The research showed that participants who were exposed to ACE inhibitors that cross the blood-brain barrier saw an average 65 percent less cognitive decline per year of exposure compared to participants taking other blood pressure medications. What I would like to know: For people who do not have high blood pressure (knock on wood) which drugs or dietary elements will best lower brain inflammation? Anyone have insights on this? Non-centrally active ACE inhibitors definitely do not help. Researchers also found that non-centrally active ACE inhibitors were associated with an increased risk of dementia and the people taking them were more likely to develop difficulty performing daily activities. Specifically, participants who, for three years, took ACE inhibitors that do not cross the blood-brain barrier were at a 73 percent greater risk of developing dementia than were the individuals taking other anti-hypertensive drugs. Centrally-acting ACE inhibitors include captropril (Capoten®), fosinopril (Monopril®), lisinopril (Prinivil® or Zestri®), perindopril (Aceon®), ramipril (Altace®) and trandolapril (Mavik®). Anyone going to get their high blood pressure drug changed as a result of this news? A mother's exposure to urban air pollutants known as polycyclic aromatic hydrocarbons (PAHs) can adversely affect a child's intelligence quotient or IQ, a study reports. PAHs are chemicals released into the air from the burning of coal, diesel, oil and gas, or other organic substances such as tobacco. In urban areas motor vehicles are a major source of PAHs. The study, funded by the National Institute of Environmental Health Sciences (NIEHS), a component of the National Institutes of Health, the U.S. Environmental Protection Agency and several private foundations, found that children exposed to high levels of PAHs in New York City had full scale and verbal IQ scores that were 4.31 and 4.67 points lower than those of less exposed children. High PAH levels were defined as above the median of 2.26 nanograms per cubic meter (ng/m3). A difference of four points, which was the average seen in this study, could be educationally meaningful in terms of school success, as reflected, for example, in standardized testing and other measures of academic performance. However, the researchers point out that the effects may vary among individual children. But one can easily imagine smarter parents figuring out how to reduce their family's exposure to air pollutants. So this could be a selection effect. But the subjects had common backgrounds and might not have differed all that much in other characteristics. Hard to tell. The study was conducted by scientists from the Columbia University Center for Children's Environmental Health. It included children who were born to non-smoking black and Dominican-American women age 18 to 35 who resided in Washington Heights, Harlem or the South Bronx in New York. The children were followed from utero to 5 years of age. The mothers wore personal air monitors during pregnancy to measure exposure to PAHs and they responded to questionnaires. Live in the country and breath cleaner air. If you have to live in a city or near a highway consider getting a HEPA filter in your residence. We are all Dr. Doolittle as babies. But can babies tell when politicians are lying? Or maybe they can predict the stock market but we just haven't figured out yet how to ask them. Or maybe they understand equations for achieving controlled nuclear fusion? Just what all do babies understand, anyhow? $20 Per Gallon Gasoline: Book Argument Plausible? Forbes writer Christopher Steiner has a new book about the approaching era of declining world oil production entitled $20 Per Gallon: How the Inevitable Rise in the Price of Gasoline Will Change Our Lives for the Better. In it he takes an interesting approach toward explaining how declining oil production will change the world. Each successive chapter is named after a progressively higher price for a gallon of gasoline. At each higher price point he describes how our lives will change. This is a novel and interesting approach aimed at explaining to a broader public what Peak Oil means for us in our daily lives. He doesn't put a timeline on when the price points will get hit or predict how much the total economy will shrink. This is more of a lifestyle approach to Peak Oil. In Chapter $8 he foresees the bankruptcy and liquidation (not reorganization) of most of the airlines in the United States and Europe. This assertion is plausible. Most people do not realize that US domestic flight seats have already shrunk 21% since 2001. For the time being, analysts agree that the airlines, by cutting routes and employees, grounding planes and imposing fees, can weather the downturn. In fact, when the latest round of capacity cuts takes effect in September, the seats on domestic flights will drop to 66.5 million — down from a peak of about 84 million in 2001 and the lowest September figure since 1984, according to OAG Aviation, which tracks flight schedules. We will, in time, return to 1970s and 1960s levels of air passenger transportation. I do not expect technological advances to prevent this because the aircraft need liquid fuels - no electrically powered substitutes available. Boeing's much ballyhooed 787 Dreamliner only boosts fuel efficiency 20%. Aircraft fuel efficiency would need to improve by multiples to compensate for Peak Oil and energy substitutes would have to be in the form of liquid fuels. Unless algae genetic engineering solves the problem we'll do a lot more of our travel on the ground. Robert Rapier has explained better than I can the problems of algae biofuels. But I have a more fundamental disagreement with him over the idea of a coming urbanism: I'm not sure that by his own logic it makes economic sense. In Chapter $16 (yes, he thinks gasoline will go that high - I'll outline opposing arguments below) he argues that the cost of long range transportation will get so high that more food will be grown and consumed locally. Well, okay. But isn't that an argument against large cities? New York City needs to bring its food in from longer distances because it has so many people. The amount of land needed to feed them all has to stretch many miles away from it. This is made all the more problematic because NYC borders on fairly built up urban and suburban areas around it that also need to have their food brought it from distant places. So isn't the high transportation cost argument an argument for the spread of people out to places closer to where the food is grown? In the United States that would be places like Nebraska, Kansas, and the Dakotas. Is $20 per gallon possible? Steiner makes no attempt to prove this. I would like to know if it is possible. My biggest puzzle about Peak Oil is just how high can the price of oil go? We know that the utter outer limit for the price of oil at any given time is something well less than world GDP divided by the number of barrel of oil made in a year. World GDP is currently about $55 trillion by one measure. Also, world oil production is about 30 billion barrels per year. If all money was spent on oil then the max price would be $1800 per barrel. Of course that's not going to happen. What would the people who sold the oil do with the money? Buy other stuff. Why spend all your money on oil if you can't even afford a car to burn gasoline or a house to heat? You aren't going to spend even a quarter of your income on energy, let alone a quarter of your income on liquid hydrocarbons. You'll move into a very small apartment in a converted house and ride a bike before that happens. Speaking of riding bicycles, rather than abandon suburbs for the big city why not follow Jeff Radtke's suggestion and convert bicycles to electric power and get around a lot on an electric-powered bicycle? No need to move to the big city. For people who have shorter commutes the price of gasoline ceases to be an obstacle when you get around on electric power. How can we hit high price points on gasoline? How high gasoline prices can go depends on substitutes. Given no substitutes at all the economy will decline with the price of oil. Less energy will mean less economic activity. Imagine a large number of lower priced substitutes for all purposes and that these substitutes all became competitive by the time gasoline hits $8 per gallon. In that case gasoline would never hit $10 per gallon for any length of time. In order to hit high price points the economy has to have enough affordable substitutes to enable economic growth to provide the buying power to bid up oil and gasoline. This would have to happen even as some subset of economically valuable uses of oil turn out to have no effective substitutes. Only then could oil and gasoline hit high price points. Steiner argues that international trade will plummet as the cost of fuel for ships skyrockets. Jeff Rubin develops this argument in greater detail in a recent book (which I have not read): Why Your World Is About to Get a Whole Lot Smaller: Oil and the End of Globalization. Are Rubin and Steiner correct? At least up to some point. But what about substitutes? Steiner misses an opportunity here because in his $18 chapter he reports the US Navy believes nuclear cruisers become cost effective at $120 per barrel (which we hit for a few months in 2008) and nuclear destroyers become cost effective at $200 per barrel. The question here is obvious: at what price of oil does nuclear propulsion become cost competitive for ocean going cargo ships? Answer that question and you will know the long term ceiling on the prices for long range container shipping. Is the price of nuclear cargo shipping so high that Wal-Mart's business models falls apart (as Steiner claims)? Or is he just expressing SWPL prejudice against Wal-Mart? In a similar vein Steiner claims that long range shipping of fruits and vegetables won't survive $16 per gallon gasoline. But a lot of vegetables and fruits move transcontinental via rail. Well, even as Steiner paints a bright picture for passenger rail in chapter 18 he fails to recognize the potential for electrified rail for freight as a way to put a ceiling on the cost of long range land-based cargo shipping. At what price of oil does fully electrified rail become cost competitive with diesel-electric train engines? That price (whatever it is) puts a ceiling on the long run price of rail cargo shipping. Suddenly rail becomes powered by nuclear reactors or wind turbines or hydro. Want to predict what'll happen with freight after Peak Oil? Ya gotta figure out the competitive prices for nuclear powered cargo ships and electrified transcontinental cargo rail. If anyone knows the answers post in the comments please. While I obviously have some bones to pick with Steiner's book I recommend it. He covers a lot of territory in an accessible way for a broader public. If you expect lots of data to prove his assertions you'll be frustrated. But if you want to get a sense of just how much the future will change as a result of the lengthening list of countries whose oil production has peaked this book hits many of the ways our lives will change. It is not a precisely calculated set of predictions. Some of his guesses will turn out wrong due to substitutes and innovations that enable less disruptive adaptations. Others will happen at different price points than he predicts. But the value here is that his book causes the reader to picture a future that is not going to be business as usual. Update: There's not a single oil price point at which nuclear powered cargo ships or electrified freight rail become cost competitive. Consider rail. The various rail lines have different levels of traffic per mile, the regions have different prices for electricity, cost of installation will vary depending on terrain and extent of surrounding industry and power lines. Plus, the cost of steel, copper, aluminum, and other construction materials varies over time. However, in an era of declining oil production rail electrification will probably make sense. Read Alan Drake and Phillip Longman on the potential to shift more freight to rail and to electrify rail. This would greatly reduce the transportation impact of Peak Oil. Also see Brian Wang on Nuclear Power For Commercial Shipping. If the optimistic numbers he provides there are anywhere near correct I do not see why Peak Oil has to cause a collapse of international trade. Update II: One of the world's largest cargo ships, the Emma Maersk, has a 109,000 hp (81 MW) engine. The whole ship cost about $145 million to build. One analysis shows a nuclear powered equivalent as having lower total costs assuming $2500/KW of nuclear power and $500/ton diesel fuel. The $2500/KW cost estimate looks low. A recent MIT cost update put big land-based nuclear power plants at $4000/KW. How do smaller nuclear power plant costs differ from the costs at larger plants? For large nuclear plants here is a recent overview of an assortment of cost estimates for new nuclear power plants. Update III: Brian Wang has put together even more useful links on nuclear-powered cargo ships. Costs for fossil-fuel powered cargo ships are going to surge because of regulated requirements for ship operators to shift to cleaner and more expensive fuels. Based on current refining capacity and planned upgrades, Purvin and Gertz estimate bunker costs could soar by about $300 a metric tons as a result of the switch to gas oil. Bunker fuel is already at $424 per ton in Singapore at the time of this writing. This price is already high enough to make nuclear-powered cargo ships cost effective according to some estimates. I do not expect global shipping to collapse due to higher fuel costs. Rather, the industry will just shift to nuclear power. Researchers at the University of Catania in Italy found that at least in tissue culture carnosine prevents the formation of cataract protein clumps. In the new study, Enrico Rizzarelli and colleagues note that the only effective treatment for cataracts is surgical replacement of the lens, the clear disc-like structure inside the eye that focuses light on the nerve tissue in the back of the eye. Cataracts develop when the main structural protein in the lens, alpha-crystallin, forms abnormal clumps. The clumps make the lens cloudy and impair vision. Previous studies hinted that carnosine may help block the formation of these clumps. The scientists exposed tissue cultures of healthy rat lenses to either guanidine — a substance known to form cataracts — or a combination of guanidine and carnosine. The guanidine lenses became completely cloudy, while the guanidine/carnosine lenses developed 50 to 60 percent less cloudiness. Carnosine also restored most of the clarity to clouded lenses. The results demonstrate the potential of using carnosine for preventing and treating cataracts, the scientists say. The key question: can supplementation increase carnosine concentration in vivo (in your body) around the eye lens enough to slow or prevent the development of cataracts? A lot of biochemicals have regulatory mechanisms that control their concentration ranges in in the body. Take too much and the chemical gets broken down or excreted or shifted to other parts of the body. One also wonders whether carnosine in eye drops would help. What I also wonder: Suppose scientists succeed in developing ways to grow replacement lenses in laboratories. Can implanted lenses work as well as original lenses? Do they anchor well? We also need stem cell therapies to rejuvenate muscles around the eye. I expect such cell therapies to reduce the need for reading glasses as stronger eye muscles improve our ability to focus. A genetic variant that boosts Alzheimer's Disease risk also accelerates aging of the brain. A new study led by Mayo Clinic researchers and published in the New England Journal of Medicine APOE e4 gene carriers showed a faster cognitive decline starting in their mid-50s. The study, which followed participants for up to 14 years, used sensitive memory and thinking tests to detect, track and compare cognitive performance in 815 healthy people, 21 to 97 years of age, with two copies, one copy and no copies of the APOE e4 gene, the major genetic risk factor for developing Alzheimer's disease at older ages. Each additional copy of this gene is associated with a higher risk of Alzheimer's disease and a slightly younger age at the onset of clinically significant memory and thinking problems. Approximately one out of four people have one copy of the APOE e4 gene, which was inherited from one parent, and about 2 percent have two copies, which were inherited from both parents. "We found that memory declines begin to differentiate groups of people at these three levels of genetic risk starting between ages 55 and 60, years earlier than previously suspected, and well before the anticipated onset of clinically significant symptoms," said Richard J. Caselli, M.D., Chair of Mayo Clinic's Neurology Department in Arizona and lead author of the research study. "While other age-sensitive cognitive skills also change, memory, specifically, appears to decline more quickly in APOE e4 gene carriers, and it is this pattern of cognitive aging that is similar to (but much milder than) what we expect to see in patients with Alzheimer's disease. This suggests that seemingly normal age-related memory loss may actually represent very early, preclinical-stage Alzheimer's disease." Regardless of whether you have this genetic variant all the dietary advice for reducing Alzheimer's risk still applies. What's the big picture here? Brain aging is the worst part of aging because it slowly takes your own mind away while you still live. We need repair and rejuvenation therapies for the brain. Some of us are going to live to see the development of these therapies. Support their development. What's at stake with rejuvenation therapy development is far greater than with the vast bulk of what we see reported on the news. We need much better therapies far more than we need more delivery of existing therapies because existing therapies can not fix most of what goes wrong with us. Keep that in mind as you listen to health care debates. Two researchers do not expect Commander Data capabilities in Androids by 2060. Everyday human interaction is not what you would call perfect, so what if there was a third party added to the mix - like a metallic version of us? In a new article in Perspectives on Psychological Science, psychologist Neal J. Roese and computer scientist Eyal Amir from the University of Illinois at Urbana-Champaign investigate what human-android interactions may be like 50 years into the future. With knowledge of present day technology, the scientists predict that within 50 years androids will be able to speak in human-like voices, identify spoken words with precision, answer questions from a body of textual information, walk and run in a human-like motion, display realistic facial expressions, and detect others' emotions through visual processing. However, even with these advances, it will be more than 50 years before we see the human-acting and organic-looking androids of sci-fi movies. By 2060, it is predicted that androids will still be unable to detect aspects of natural language, and be incapable of forming conclusions from visual sensory input (specifically, seeing but not understanding). The most difficult development in artificial intelligence (AI) is trying to program the "Theory of Mind," or the effortless human ability to process other people's speech, actions, underlying motives, and emotional state. Roese and Amir predict that by 2060 androids will be used for menial jobs, such as toll collectors, where the presence of a non-human is practical, but not frightening. A major worker shift from people to androids, similar to the shift to machines in factories, is expected to occur. Toll collectors? There've been toll collecting machines for years. If and when AI cars and trucks are allowed to drive themselves then truckers are going to need to find other ways to make a living. I'd like to see more automation of the most dangerous jobs first. For example, lumberjacks have among the most dangerous jobs. See page 13 here for a table of rates and absolute numbers of deaths in occupations. An even better table of fatalities per hours worked shows fishing and logging as the most dangerous. Androids out in forests and on fishing boats (assuming any fish remain) could replace humans in dangerous jobs. Hopefully the androids could operate the equipment better as well. I do not find human-shaped highly intelligent machines as most interesting. Rather, machines that do highly valuable work for us which are shaped for specialized jobs are of much greater value. For example, robotic surgeons are improving quality of surgery and minimizing the amount of recuperation needed by causing less avoidable damage. We will need robotic surgeons to help replace aging body parts as they wear out. Once advances in tissue engineering and stem cell manipulation make it easy to grow replacement organs and joints we will need robotic surgeons to reduce the error rates and costs for their implantation. Also, robots far less powerful than future androids allow doctors to do remote medical rounds cut costs and extend the reach of the most talented specialists. By age 6 brain areas for modeling others have shown up and begun functioning. Social cognition—the ability to think about the minds and mental states of others—is essential for human beings. In the last decade, a group of regions has been discovered in the human brain that are specifically used for social cognition. A new study in the July/August 2009 issue of the journal Child Development investigates these brain regions for the first time in human children. The study has implications for children with autism. Researchers at Massachusetts Institute of Technology (MIT) and Yale University scanned the brains of 13 children ages 6 to 11 as they listened to children's stories. At the moment the plot of the stories revealed what a character wanted, believed, or knew, or presented the mental state of the character, the researchers observed increased activity in these specific brain regions. When the story turned to other topics—such as the physical world or the visual appearance of the characters—activity in these brain regions went back down. Do people on the autistic spectrum have smaller brain areas dedicated to social cognition? Do adult Aspies have less brain area dedicated to reading others and modeling others? If so, do they have more brain area dedicated to path and reasoning? Here's a big non-shocker: science shows once again that in adolescence girls become different than boys in how they think. What type of cognitive ability changes more in male adolescents? I would expect spatial reasoning to take a big leap in developing males. The mind areas for thinking about other people are developing in preschoolers. The study, in the July/August 2009 issue of the journal Child Development, was conducted by researchers at Queen's University at Kingston in Ontario, Canada. In the preschool years, children develop social skills by learning how to understand others' thoughts and feelings, or their theory of mind. In most children, theory of mind changes over time so they come to understand that others' thoughts are representations of the world that may or may not match the way the world actually is. In their study of EEGs of 29 4-year-olds, the researchers found that these changes are related to the functional development of two parts of the brain—the dorsal medial prefrontal cortex and the temporal-parietal juncture—that govern similar understanding in adults. "For a while now, we have known that specific brain areas are used when adults think about others' thoughts," according to Mark A. Sabbagh, associate professor of psychology at Queen's University at Kingston and the study's lead author. "Our findings are the first to show that these specialized neural circuits may be there as early as the preschool years, and that maturational changes in these areas are associated with preschoolers' abilities to think about their social world in increasingly sophisticated ways. I wonder whether brain scans of 5 year olds can show which ones will grow up by be highly skilled at handling other people and which will do poorly at relating to others. The hormone treatment she underwent to reverse menopause seems a likely cause of the cancer that killed her. Maria del Carmen Bousada died of a tumor that showed up a few months after she gave birth. A Spanish woman who became the world's oldest mother at the age of 66 has died of cancer just two-and-a-half years after giving birth to twins, raising fresh questions about the ethics of fertility treatment for women past natural childbearing age. Maria del Carmen Bousada, a single mother and retired sales assistant from Cádiz, southern Spain, leaves behind her orphan sons, Pau and Christian. Should it be legal for women to have children that they can't possibly be expected to raise to adulthood? I do not think so. What do you think? Her brother is in his 70s. The kids will probably end up getting adopted at some point. Medical ethicist Kerry Bowman of the University of Toronto in responding to Bousada's death mentions that women who have had a few rounds of cancer are trying to make babies. Instinct overrules reason. Reproductive technology is defeating some of the restraints that aging places on reproductive capabilities of humans. Those restraints served the useful purpose of preventing physically less fit mothers from making babies they wouldn't be around to raise. Defeating nature isn't always wise. But the technological capability to defeat nature isn't always accompanied with the wisdom of knowing when to accept natural restraints. This latest announcement from Exxon fits into a larger trend where the big oil companies pull back from solar photovoltaics and other non-liquid energy forms and instead focus their efforts on liquid hydrocarbons. Oil giant Exxon Mobil Corp. is making a major jump into renewable energy with a $600 million investment in algae-based biofuels. Exxon is joining a biotech company, Synthetic Genomics Inc., to research and develop next-generation biofuels produced from sunlight, water and waste carbon dioxide by photosynthetic pond scum. But let us put that in perspective. In 2008 ExxonMobil had $443 billion in sales and $45 billion in earnings. So $600 million is chump change for them. I wonder what odds they place on this effort working. Other recent biofuel venture fundings included oil refinery operator Valero as an investor for Solix Biofuels. There were also at least two funding rounds in June. Solix Biofuels Inc. closed on $16.8 million to complete construction of a demonstration-scale facility, with investors including Shanghai Alliance Investment Ltd., London-based I2BF Venture Capital, Bohemian Investments, Southern Ute Alternative Energy LLC, petroleum refiner Valero Energy Corp. and Infield Capital. Solazyme Inc. added $12 million in an interim round standing at $57 million, which was led by Braemar Energy Ventures and Lightspeed Venture Partners and brought in new investor VantagePoint Venture Partners. The oil companies are best thought of as companies that specialize in liquid hydrocarbons. The convenient storage and energy density of liquid hydrocarbons make them the single most widely used fuel for transportation with no other fuel even coming close. What is not clear: can genetically engineered algae ever become a cost effective energy source with a favorable ratio of energy return on energy invested? Several diesel and hybrid cars beat regular gasoline counterparts in operating costs. An annual study by IntelliChoice.com shows most 2009 model-year hybrid and “clean diesel” vehicles deliver a lower cost of ownership compared to their gasoline-burning counterparts. The company concluded that clean diesel technology — included in the survey (.pdf) for the first time this year — could be a “game changer” in North American, especially if the Obama Administration adopts a tax program to encourage use of the fuel. Non-fuel operating costs. Note that diesel engines last a long time. But Toyota wins overall on quality against VW. Whether you drive more city or highway miles. The Prius is going to win in lots of stop-and-go traffic. The Jetta will shine on the highway. The relative costs of gasoline and diesel fuel. The last point is the one I find hardest to call. Just a quarter mile from where I sit in SoCal the Shell station is selling diesel for 20 cents a gallon less than gasoline. But in the summer of 2008 the price of diesel soared over that of gasoline and at that same Shell station diesel briefly cost 96 cents more than gasoline per gallon. I saw an even larger premium for diesel in Michigan last year. The economic downturn has suppressed trucker demand for diesel by more than car driver demand for gasoline. But what will be the relative prices of gasoline and diesel 1, 2, 3, 4 years from now? I don't know. In Morgan Downey's excellent book Oil 101 (which covers the basics of the oil industry) I learn from chapter 7 that 22% of US oil refinery output goes to diesel versus 27% worldwide. So there's some room for expanding diesel fuel output. But there are limits to how much of a barrel of oil can get turned into diesel. What I'd like to know: how much of America's car fleet can be switched to diesel? Other governments pushing diesel already cause US refineries to export diesel and import gasoline during some (all?) periods of time. So I see signs of limits for diesel supply on a global level already. What's good for your heart is good for your brain too. Of course this could result from smarter people choosing to eat a healthier diet. They start out smarter and they continue to be smarter. But a poor cardiovascular system is going to mess up your brain. Other research finds that reduced blood flow precedes Alzheimer's. Previous research finds that vegetable and fruit juice consumption are correlated with a large reduction in Alzheimer's risk. Yet another study found the Mediterranean Diet is associated with lowered Alzheimer's risk. Eat fruit, nuts, vegetables, beans. Cut back on meats. Doing this delivers many benefits. A delay in brain decay is likely one of them. Remember in the original Star Trek series how the blind woman with a sensor cape Miranda Jones could see what's around her by using her cape? In real life MIT researchers are working on a clothing fiber that will embed lots of mini-cameras making an outer garment that might some day feed images from all directions into the brain. Imagine a soldier's uniform made of a special fabric that allows him to look in all directions and identify threats that are to his side or even behind him. In work that could turn such science fiction into reality, MIT researchers have developed light-detecting fibers that, when weaved into a web, act as a flexible camera. Fabric composed of these fibers could be joined to a computer that could provide information on a small display screen attached to a visor, providing the soldier greater awareness of his surroundings. The researchers, led by Associate Professor Yoel Fink of the Department of Materials Science and Engineering (DMSE), emphasize that while such an application and others like it are still only dreams, work is rapidly progressing on developing fabrics capable of capturing images. In a recent issue of the journal Nanoletters, the team reported what it called a "significant" advance: using such a fiber web to take a rudimentary picture of a smiley face. Humanity needs to get cracking and invent all the stuff that the Federation is going to need in coming centuries. Kevin Bullis of MIT's Technology Review takes a look at arguments against building a massive and expensive continent-spanning electric power grid. What's more, advances in technology could change the economics involved and make long-distance wind transmission projects obsolete. For example, far-offshore wind farms could be located just a few dozen miles from major cities and provide wind power that is cheaper and more reliable than wind farms on land. Hauser says that ultimately, stringing high-voltage trunk lines from the Midwest to the rest of the country is unnecessary. What's more important is developing a smarter grid. Equipping transmission lines, distribution networks, and electrical appliances in homes and businesses with sensors and controls that can communicate remotely with grid operators could reduce demand for electricity, allow existing lines to handle more electricity, and make it easier to integrate wind and other intermittent renewable-energy technologies. The wind power industry wants the massive grid approach so that when wind isn't blowing in some areas then wind electric power can still be brought in from more distant locations. But a smart grid that could turn off appliances during power dips could reduce the need for more distant sources of electric power. More flexible demand would make more variable supplies of wind and solar electric easier to integrate into the grid. I suspect that a big spend on long distance electric power lines would pull resources away from more productive uses. Also, how solidly is the variability of wind understood? Would long distance electric power lines really allow wind from different areas to act like a single more reliable power source? The answer isn't clear to me. Moderate Alcohol Intake Cuts Dementia Risk? Teetotalers are running a greater risk of dementia? Drink your wine with some fish to ensure a risk reduction. Then add vegetables and fruits spiced with turmeric for the curcumin which also appears to cut Alzheimer's risk. Okay folks, what do you make of this? Some people do not feel tempted to lie. CAMBRIDGE, Mass. – A new study of the cognitive processes involved with honesty suggests that truthfulness depends more on absence of temptation than active resistance to temptation. The study is published in Proceedings of the National Academy of Sciences, and was led by Joshua Greene, assistant professor of psychology in the Faculty of Arts and Sciences at Harvard University, along with Joe Paxton, a graduate student in psychology. "Being honest is not so much a matter of exercising willpower as it is being disposed to behave honestly in a more effortless kind of way," says Greene. "This may not be true for all situations, but it seems to be true for at least this situation." Do you know people who seem to default to lying to a point where it is counterproductive for them? I come across this tendency and I suspect imaging of their brains would show the opposite of what scientists found in honest people above. Some people are more disposed to dishonesty or violence or thievery or other unethical activities. Others do not even feel tempted to unethical behavior. The people who live more ethical lives mostly do not fight an uphill battle to act ethically. Vienna, July 12, 2009 – Results from two large studies using DHA, an omega 3 fatty acid, were reported today at the Alzheimer's Association 2009 International Conference on Alzheimer's Disease (ICAD 2009) in Vienna. One of the trials was conducted by the Alzheimer's Disease Cooperative Study (ADCS) supported by the National Institute on Aging (NIA), and the second by Martek Biosciences Corporation (Martek), the primary company that makes algal DHA for supplementation. The NIA trial lasted 18 months and was conducted in people with mild to moderate Alzheimer's. Martek's trial was six months, and the compound was tested in healthy people to see its effect on "age related cognitive decline" (ARCD). Both studies used Martek's algal DHA. The results of the ADCS trial show no evidence for benefit in the studied population. The Martek trial showed a positive result on one test of memory and learning, but that study was in healthy older adults, not people with Alzheimer's or another dementia. The results need confirmation, as is standard scientific practice. Getting more omega 3 fatty acids might slow down brain aging. There is also previous research in mice that suggests omega 3's delay onset of Alzheimer's and it might do this by cutting inflammation. But once your brain has accumulated so much damage that Alzheimer's symptoms are easily discernable it is not surprising that it is too late for nutrients to make a difference. Nutrients probably work by cutting the rate of damage accumulation. Brain changes are detectable years before AD diagnosis. The damage has already been done. You might have poor vascularization starving your brain. You might have a lot of accumulated DNA damage. What should you do? The key is to adopt healthy diet and lifestyle decades before you might get AD. Boring old fruits and vegetables appear to reduce disease risk just like for many other diseases of old age. The cholesterol lowering drug simvastatin appears to cut Alzheimer's risk too. Chuck Squatriglia of Wired takes a look at Zero Motorcycles electric motorcycle model Zero S.
The 4-kilowatt-hour lithium-manganese battery is good for an average range of 40 to 45 miles and a maximum of 60, depending upon how hard you twist the throttle. Once it's dead, you're looking at four hours to charge it from a 110-volt outlet. You can plug it into a 220-volt line but it won't charge any faster because the charger is limited to 1,000 watts, and at 110 volts, a 15-amp U.S. wall outlet already exceeds that by 650 watts. It goes for $9,950 and accelerates from 0 to 60 mph in less than 4 seconds. The price is in the realm of the affordable for most people in industrialized countries. The threat of Peak Oil (also see here) has me looking for affordable technologies that can help us transition away from oil for transportation uses. While electric cars seem an obvious alternative the problem is that electric cars cost too much while having limited range. General Motors is frantically trying to bring the Volt in for less than $40,000 when it goes into production late next year, and even then expects to lose its shirt. The Mitsubishi iMiEV city car is as small as its $50,000 price tag is large. And even the Coda, a four-door, five-passenger family car with all the pizzazz of a Hyundai Sonata, will set you back $45,000 when it goes on sale in California next year. One can hope that will change. But if it doesn't we might find ourselves riding electric motorcycles in 5 to 10 years. The Zero S's 4 kilowatt-hours for 40 miles works out to 100 watt-hours per mile. That's less than half the 217 watt-hours per per mile of the Tesla Roadster. The Roadster's 244 mile range gives it 4 to 6 times the range of the Zero S. But for commuters the Zero S would work. At $109,000 the Roadster costs 11 times as much as the Zero S.
But if $10k for an electric motorcycle is above your price range cheaper approaches for electric bicycles will hit the market once world oil production goes into global decline. After 20 years of waiting (hope you didn't get too impatient) the answer is finally in: This study increases the likelihood that calorie restriction will extend human life too. MADISON — The bottom-line message from a decades-long study of monkeys on a restricted diet is simple: Consuming fewer calories leads to a longer, healthier life. Those on calorie restriction have a less debilitated old age too. They get less cancer, less insulin-resistant diabetes, less decay in motor control, less decline in motor functions. What I want to know: Will resveratrol deliver these same benefits in humans without the need to live in perpetual hunger with a gaunt skinny look? Calorie restriction may seem promising, but it has potential downsides, including constant hunger, sensitivity to cold, weakened immune function and sour mood, says Susan Roberts, professor of nutrition and psychiatry at Tufts University, where she is leading a study on calorie restriction diets. My guess is that someone on CR will do worse in an accident because their body will have less reserves to draw on. Anyone know if that's the case? The International Union for Conservation of Nature (IUCN) Red List of Threatened Species report finds several hundred species have gone extinct since year 1500. Many more species went extinct during this period of time without first becoming recognized and classified by humans. Every sector, whether it be trade, fi nancial, or health, has its metrics for monitoring trends. For biodiversity The IUCN Red List is that metric. Around 45,000 species have been assessed to-date. This is a tiny fraction (2.7%) of the world’s described species (with current estimates of the total number ranging from 5 to 30 million). We now know that nearly one quarter of the world’s mammals, nearly one third of amphibians and more than 1 in 8 of all bird species are at risk of extinction. This allows us to come to the stark conclusion that wildlife (the word used in more technical circles is biodiversity) is in trouble, and the extent of the current risk of extinction varies between different species groups. For this reason IUCN is increasing the number of conservation assessments of species in the marine and freshwater realms, and for plants and invertebrate groups. Some early fi ndings of this work are presented here. See page 41 for a table of threatened species by type.Vertebrates are most threatened. The lichens, assorted algae, and mushrooms so far are not threatened at all. CMU researchers find it too easy to figure out US national identity numbers of individuals. I have become a lot more wary about publishing info about details of my identity. I don't put my birth date on Facebook and similar venues just because I want to reduce my risks of identity theft. Online credit card application forms make it easier to guess credit cards. I get annoyed at financial institutions that use too few password recovery standard questions and that use questions that have answers that are too easy for others to figure out from public sources. Plus, asking a person's favorite pet's name is dumb for two reasons. First off, some names are more popular for dogs. Second, lots of people know the names of current and previous dogs of others. Some online financial institutions ask user name and password on the same page. A smaller number of others (and I'm not going to mention by name one I use that is better) first ask your user name and then show you a separate password form personalized to you that does a better job of telling you that you really are dealing with that institution. More should do this. Also, when typing in a password more financial institutions should show you a password quality measure. A few I deal with do. But most provide no indication whether your password will be easy to guess. Coffee Could Reverse Alzheimer's Disease? Tampa, FL (July 5, 2009) – Coffee drinkers may have another reason to pour that extra cup. When aged mice bred to develop symptoms of Alzheimer's disease were given caffeine – the equivalent of five cups of coffee a day – their memory impairment was reversed, report University of South Florida researchers at the Florida Alzheimer's Disease Research Center. Back-to-back studies published online today in the Journal of Alzheimer's Disease, show caffeine significantly decreased abnormal levels of the protein linked to Alzheimer's disease, both in the brains and in the blood of mice exhibiting symptoms of the disease. Both studies build upon previous research by the Florida ADRC group showing that caffeine in early adulthood prevented the onset of memory problems in mice bred to develop Alzheimer's symptoms in old age. "The new findings provide evidence that caffeine could be a viable 'treatment' for established Alzheimer's disease, and not simply a protective strategy," said lead author Gary Arendash, PhD, a USF neuroscientist with the Florida ADRC. "That's important because caffeine is a safe drug for most people, it easily enters the brain, and it appears to directly affect the disease process." Incandescent Bulbs To Close Efficiency Gap With Fluorescents? The first bulbs to emerge from this push, Philips Lighting’s Halogena Energy Savers, are expensive compared with older incandescents. They sell for $5 apiece and more, compared with as little as 25 cents for standard bulbs. So this regulation for light bulb efficiency spurred a lot of innovation. A company called Deposition Sciences is developing methods to increase efficiency and licensing the technology to light bulb manufacturers. One approach: reflect heat back onto the filament the heat gets converted into light. Other innovators are also finding ways to improve the efficiency of these bulbs. The people who dread what previously seemed like an inevitable switch to fluorescents and LEDs are going to be happy to hear that the incandescents will survive. Euan Mearns, writing on The Oil Drum Europe, takes a look at predictions made by Richard Duncan and Walter Youngquist in a paper they published in 1999 about expected future oil production peaks in assorted oil producing countries. So far Duncan and Youngquist's predictions on peak dates have achieved pretty decent accuracy given the quality of data they had to work with to make their predictions. If their predictions continue to be even half as accurate we are in deep trouble. Duncan and Youngquist list 42 countries representing 98% of global production in Table 1. Of those, 8 countries were already past peak at the time the paper was written and a further 5 countries were forecast to peak some time after 2007 (the year I first looked at this data), those being Brazil, Iraq, Kuwait, Saudi Arabia and the UAE. A further 3 countries are not listed by BP leaving a group of 26 countries that were forecast to peak between 1999 and 2007. I have just updated this exercise using the 2009 statistical review. I compared Duncan and Youngquists's forecast date with actual peak dates for individual countries. The distribution of these differences are shown in the chart up top. Once I had sorted the data I realised the most significant point was the rough normal distribution and that countries that had been "overestimated" were balanced by countries where an "underestimate" had been made. Summing the differences yields a value of -7 years when averaged for the 26 countries yields -0.3 years or - 4 months per country forecast. Weighting the countries for annual production reduces this bias further. This is a remarkable achievement. These guys predicted a 2007 world oil production peak. Oil went a little higher in 2008. If they were only off by a year then the current recession is just the beginning of a deeper downturn. Duncan and Youngquist forecast that world oil production would peak at 30.64 Gb/ annum in 2007 translating to 83.95 mmbpd. According to BP, 2007 production was 81.44 mmbpd that was exceeded by 81.82 mmbpd in 2008. It is of course premature to call 2008 as peak year although I am increasingly skeptical that the 2008 production will ever be exceed. If Duncan and Youngquist's unbiased accuracy follows through to Brazil and the 4 big gulf producers - Iraq, Kuwait, Saudi Arabia and the UAE, then this will underpin their 2007 peak oil forecast, reinforcing the view that 2008 saw the passing of peak oil. Duncan and Younquist told us 10 years ago that peak oil will be buried in a bumpy plateau and that a number of years must pass before it will be evident from declining production that peak has indeed passed. The exact timing is unimportant. The important thing is the knowledge that we are within the plateau and that some scientists do understand the above and below ground factors leading to peak and that their warnings of decline past peak and its consequences should not be ignored. Energy analyst Charlie Maxwell is predicting a 2015 date for world oil peak production. In that case we are going to go thru a period which Robert Rapier calls "Peak Lite". I just updated to MovableType 4.261. Unfortunately commenting broken when I did this. So if you can't view or make comments I'm aware of the problem. If any MT knowledgeable are reading this: I've been using MTSecurityCode and MTSecurityImage from the SCode plugin. I suspect that they are causing the problem. If you know how to migrate a Comment Preview Template to the newer CAPTCHA feature in MT 4 then contact me in email. I also do not see the cursor in Mozilla Seamonkey while editing a blog post. Any ideas? Parenthetically, problems with the upgrade are causing a pause in my posting. Hopefully should resume soon. Update: Comments now work via full post entries but not via the Comments link. You can now use the permalink to an individual entry, write a comment, hit preview, enter the CAPTCHA code, and Post a comment. I still have problems getting the pure comments view to work. Update: They do not migrate the comments listing template? Still fighting with the blogging software. Expect to start showing some improvements in blog site functionality once I'm done though. The shrinkage of ocean floor seagrass meadows is accelerating and human activity is to blame. While marine ecologists have been measuring localized seagrass loss for decades, they had never before pooled their information to get a global perspective. So a team led by Michelle Waycott of James Cook University in Townsville, Queensland, Australia pooled data from 215 regional studies, from 1879 to 2006. They found that the total area of known seagrass meadow had decreased by 29 per cent over the 127 years. They also found that the rate of loss had accelerated, from less than 1 per cent per year in the 1940s to 7 per cent per year since the 1990s. Pollution, fertilizer run-off, and even sediment run-off caused by development projects are cited as causes. Fertilizer nutrient run-off and soil run-off can be reduced with no-till farming techniques. In the U.S., no-till agriculture fits under the broader U.S. Department of Agriculture definition of conservation tillage. Conservation tillage includes any method that retains enough of the previous crop residues such that at least 30 percent of the soil surface is covered after planting. The protective effects of such residues are considerable. According to the USDA’s National Resources Inventory data, soil erosion from water and wind on U.S. cropland decreased 43 percent between 1982 and 2003, with much of this decline coming from the adoption of conservation tillage. Soil protection is not the only benefit of no-till. Leaving crop residues on the soil surface helps to increase water infiltration and limit runoff. Decreased runoff, in turn, can reduce pollution of nearby water sources with transported sediment, fertilizers and pesticides. The residues also promote water conservation by reducing evaporation. In instances where water availability limits crop production, greater water conservation can mean higher-yielding crops or new capabilities to grow alternative crops. A world wide push for conservation tillage would reduce soil erosion, reduce energy used by agriculture (especially important with Peak Oil approaching), and cut down on algae blooms. Check out satellite pictures of algae blooms in hte Volga River Delta and Caspian Sea. Update: K points out that the math above on the rate of loss doesn't make sense. How can 29% be lost if the yearly loss rate starting around year 2000 is 7%? 8 years of 7% yearly loss would leave us with 56% remaining just from those recent years. I suspect the reporter made a mistake. Charles T. Maxwell, senior energy analyst at Weeden & Co., has been analyzing the oil industry for longer than most of us have been alive. Well connected and respected within the industry, his opinions can not be portrayed as coming from the fringe. Maxwell believes world oil peaks by 2015 and we are headed for a 10-12 year financial downturn as a result. A lot of people have said that the year 2015 is too far out for the peak. But I built a big margin in there because I thought we might have two recessions. I didn’t dream that we would have one really big one. So I’ve still got 2015 out there. But if you said to me last July, when do you really believe the peak is going to come, I would have said 2013. I started years earlier by estimating 2015 and I happily held to that view as I saw the recession begin to develop because I could see that we would probably push it off a little bit. For your purposes, I’ve got 2008 for the peak of non-OPEC-not really a peak, it’s a plateau, but we’re falling off it now. And then 2011 for the peak of the top 50 listed companies, the ones that dominate the stock market, so the stock market investors will say the oil industry has peaked because their stocks have peaked. And then I’ve got 2013 for the peak of black crude oil and then 2015 for the all-liquids peak, which I take to be ultimate peak oil. And that would include gas-to-liquids, coal-to-liquids, NGLs. And it would include both synthetic and natural crudes. Solar costs too much, ethanol is a loser (I totally agree), and Maxwell even thinks ultimately we are going to be disappointed by wind. If you look at solar power, it’s terrific, so terrific, so fast growing….that without a subsidy, no one will use it. So it’s not very attractive, and people don’t admit that. And I think it’s the same thing with ethanol, which was a loser from the start. And I think it’s the same thing with wind energy. I think wind energy is going to turn into a huge disappointment because so many hopes are being pinned on it. I have two main questions about wind: How fast will wind's costs fall? Also, how much can long distance DC power lines allow wind from different areas to back each other up? The second question really has two components. The first relates to the cost effectiveness of really long range (thousand or more miles) transmission of electricity. Will superconductors help? If so, how soon? The other component relates to wind: how uncoupled are wind patterns in areas many hundreds of miles apart? I think the jury is still out on that and I've yet to see the published study using real world data from enough locations far enough apart from each other and over years of measurement. I'm taking a skeptical view of large scale baseload wind power. A partial shift toward electric cars will lessen the problem with wind's intermittency. But we still need baseload power. We could free up more natural gas for use in transportation by building up more baseload nuclear power. Granted, nuclear power won't help us in the 2010s. But it could make a much bigger contribution in the 2020s. In the second part of his interview Maxwell looks at the fuels we have to turn to as major sources when oil production starts declining yearly across the globe. He sees natural gas, coal, nuclear, and conservation as the main energy sources we can hope to turn to as substitutes. Note that he doesn't see wind and solar as major alternatives in the 2015 time frame. Leave aside the long term potential. What happens in 2015, 2016, 2017? We all eat in the short run. In effect, by 2015 we’ve got five fuels that we’re talking about here: oil, gas, coal, and nuclear. And the fifth one we’ll call a “fuel,” which is energy efficiency and conservation. It acts like a fuel. It gives you more work done at lower energy volumes. So in that situation you have really got Hubbert’s peak operating to keep you from using the oil alternative. The obvious easy answer politically is to import more oil, but there’s not going to be any place to import more oil from. And the costs are going to be higher and higher, so we’re stalled out on that one. But you go on with oil; you don’t stomp on oil because that would increase the size of your problem immensely, very quickly, and without any reasonable basis. You just can’t emphasize it because it isn’t a solution; it’s just a maintenance story. Maxwell correctly sees the main problem with nuclear is build times. So then you go over to nuclear and you don’t have the time. You can try to summon up anything you want but if you don’t get it for 10 years…the vulnerability is going to be right here between 2011 and 2021. That decade is going to, I think, be the maximum vulnerability; that’s when we’re going to take it on the chin. So nuclear can’t get there in time. We should be doing something on nuclear for days ahead, but it won’t help us during the upcoming decade unless we started it today and we aren’t going to start it today because the public is not yet ready for it. France is really in the best position to assure affordable electric power going to the Peak Oil era. Already 80% of France's electric power comes from nuclear power and the French are building another nuclear reactor at Flamanville. For a variety of reasons few of the French oppose nuclear power. On nuclear power I think the French are wiser than Americans overall. Maxwell sees a bright future for natural gas from shale fields. Maxwell is responding to the much brighter prospects for extracting the massive amounts of natural gas in the shale plays. The Haynesville shale in Louisiana, Barnett shale in Texas, Marcellus shale in the US Northeast and other shales can be accessed with horizontal drilling and hydrofracturing. I'm beginning to think that the T. Boone Pickens Plan for powering cars with natural gas makes sense. Electric cars will have a role too. But existing cars can be converted to natural gas (especially if legislative and regulatory bodies decide to allow it) pretty quickly and for far less money than existing cars can be converted to electric power. In a nutshell, I do not see a viable alternative to natural gas powered cars. Biodiesel algae looks too long term. The energy returns from corn ethanol are too low (and we do not have enough land to grow enough corn anyhow). Conversion of coal to liquid costs much more and is too dirty. A shift to more electric powered cars makes sense. But the time to make the transition is too long and the costs too high for electric powered cars to be the main transportation response to Peak Oil. I do not see mass transit as a solution for most people because even in Europe with much higher fuel costs and more subsidized mass transit 85+% of passenger miles traveled are still by car. Mass transit takes more time because it is not door-to-door. For people with lower budgets or shorter distance traveling needs conversion of bicycles to electric power could pretty cheaply keep a lot of people going to work. Maxwell expects an economic crisis that lasts from 10 to 12 years as we start to respond to Peak Oil too late. That sounds about right to me. The economy will shrink as the amount of oil available to drive it declines every year. To do the massive capital investments needed to develop alternatives a larger fraction of a shrinking pie will need to be allocated (whether by market mechanisms or government fiat) toward developing alternatives and investments in efficiency. One can claim we already have many of the technologies we need to adjust to Peak Oil. I would agree. But capital build lead times are long and turn-over in auto fleets and other equipment that uses energy takes many years. Few people or companies can afford to just junk all their cars, trunks, and other equipment and replace it with stuff that runs on electric power and natural gas. Maxwell sees $300 oil as inevitable. I am less sure. Writing from Switzerland Francois Cellier argues that demand destruction will keep oil below $200 per barrel in the long run. Though even if that's a long term upper limit one can still imagine spikes above that price. So when world oil production starts declining at 4-5-6% per year how high will prices go? Possibly if the US dollar goes into a major decline against some other currencies $300 per barrel would be possible. Though I suspect that the dollar's value will be a lot less if and when that happens. What do the alternatives cost? Electric power derived from a number of sources is going to play a larger role as in energy-intensive applications as oil gradually fades from the scene. 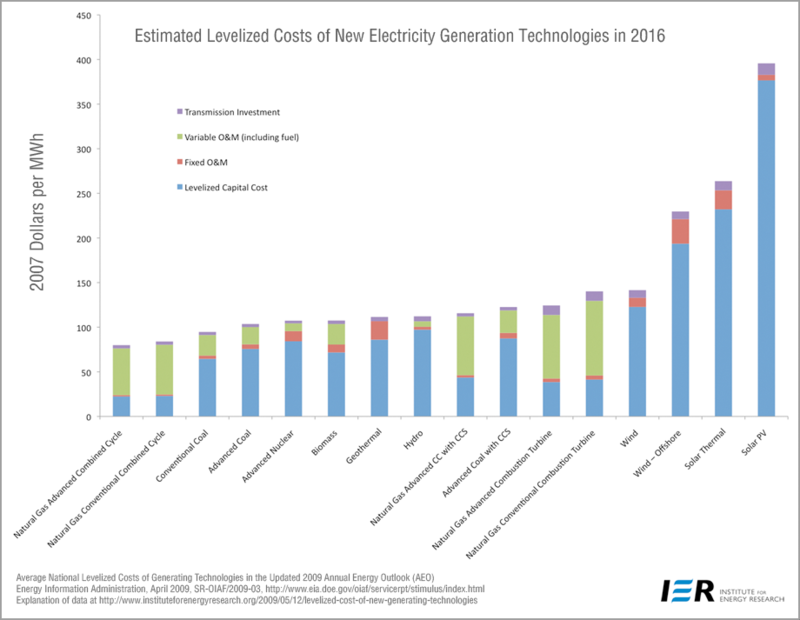 The Institute for Energy Research has a report Levelized Cost of New Electricity Generating Technologies which you can view as a graphical of expected comparative costs for the main methods of generating electricity in 2016. Note they have wind and solar as still far more expensive than natural gas or coal with carbon capture and storage (CCS). But if low carbon dioxide emissions at the lowest possible cost is your goal then nuclear beats fossil fuels with CCS. Also, wind isn't far above the costs of nuclear, natural gas and coal. But it is not dispatchable (i.e. only generates when the wind blows - now when you want it to). Regulatory agencies should make conversion of cars to run on natural gas easier to do legally. The cars will probably pollute less on natural gas. So let people pay aftermarket suppliers to make the conversions and then do spot tests to see if any models of cars are problematic on natural gas. Encourage car companies to provide engine calibration files where necessary for conversions. Governments should start buying natural gas powered cars and hybrids for their fleets. Phase out the purchase of plain gasoline vehicles. Use loan guarantees to restart the nuclear power industry. Utility regulators should prod electric utilities to convert remaining oil-fired electric power plants to the most efficient coal or natural gas designs. The US Department of Agriculture (and similar departments in other countries) should look for policies that will bring natural gas to more farms to replace diesel and gasoline for water pumps, crop drying, and other energy intensive applications. Mass transit money from governments should go to natural gas, hybrid, and electric powered buses and trains. Phase out less efficient vehicles and migrate to electric power to the extend practical. Standards for home and commercial building energy efficiency should allow people to build and buy homes certified to higher energy efficiency levels. Then mortgage providers can factor in lower utility costs when considering ability to make mortgage payments. Got any good energy policy ideas? Even if you do not have multiple sclerosis (MS) or know anyone who has MS the research into how to repair myelin sheath (nerve insulation which gets damaged in MS) matters for your own brain's future. As we age our myelin sheath degrades and this contributes to cognitive decline experienced as people get older. Therefore I always cheer on MS research more than research in most diseases. Work at USCF and U Cambridge put to a regulatory pathway as key for telling oligodendrocyte cells to make more myelin. In this study the researchers have identified the Wnt pathway, which plays an active role in the maintenance and proliferation of stem cells, as a crucial determinant of whether oligodendrocytes can efficiently make myelin. Their studies demonstrate that if the Wnt pathway is abnormally active, then the process is inhibited. This opens up the exciting possibility that the repair can be enhanced in MS patients by drugs that block the Wnt pathway. Professor Robin Franklin from the University of Cambridge, a co-senior author of the study, explained the significance of their findings: "The pathway we identified plays a critical role in whether repair to the damaged cells will or will not occur. Interestingly, mutations in this particular pathway are also involved in several cancers. In this regard, drugs that inhibit this pathway from signaling have been sought which might suppress tumour growth. These same drugs may also find a role in promoting repair in MS."
Regulatory pathways that control growth are always of interest to cancer researchers. So cancer research work has helped build up information about the Wnt regulatory pathway that helps MS researchers in their own investigations. More generally, cancer research into cell growth regulation helps to build up the knowledge we need to develop a large assortment of cell therapies. Gene chips which allow fast measurement of activity of large numbers of genes made this research possible. To find out which genes were contributing to three key stages in the repair process – the recruitment of oligodendrocyte precursors to the site of injury, the maturation of those cells into functional oligodendrocytes, and the formation of a new myelin sheath -- they measured the activity of 1,040 genes. All of the genes they studied encode transcription factors, which regulate the activity of other genes. Their experiments showed that 50 transcription factors are working during key steps in myelin repair. One of the reasons I expect a revolution in biomedical treatments over the next 20 years is the development of chips that can do massively parallel manipulations and measures with cells and cellular components. Biotechnology now benefits from the same shrinking of scale that has done so much to double computer power many times. The researchers were able to focus on a single gene that might make a good target for drug development. The team then honed in on a gene called Tcf4, because its expression was strong in damaged areas where repair attempts were under way. Tcf4 is involved in a cascade of biochemical events known as the Wnt (pronounced "wint") pathway, whose importance has been well recognized in normal development of many tissues, including the brain. Until now, however, Wnt had not been linked to myelin production or repair. "This is the first evidence implicating the Wnt pathway in multiple sclerosis," says lead author Stephen P.J. Fancy, PhD, a postdoctoral fellow in the Rowitch lab. "We consider this an exciting development in our efforts to understand why the repair process often fails in the disease." Some of us alive today will live long enough to see tissue repair to become commonplace throughout the body. Development of this capability will slow and eventually reverse the aging process. Bored of the same old hormones for boosting your muscle mass? Wnat to try a new trendy buffing hormone? Mechano Growth Factor (MGF) could become the next rage for athletic dopers. Scientists in the UK and Denmark have shown that if elderly men were given growth hormone and exercised their legs showed an appreciable muscle mass increase. Dr. Geoff Goldspink (Royal Free and University College Medical School, UK) says: "This raises the question: Can age-related loss of muscle strength and increased fragility be ameliorated by the therapeutic application of mechano growth factor (MGF)?". There is hope that MGF can also help sufferers of diseases such as muscular dystrophy, ALS, renal disease or cancer, for whom intensive exercise is not an option. It may even prove useful to ameliorate muscle loss resulting from long periods in zero-gravity conditions during space travel. Dr. Mark Lewis (University College London, UK) will present their latest results on how MGF exerts its effects during his talk at the Society of Experimental Biology Annual Meeting in Glasgow on Wednesday 1st July 2009. When muscles are stretched during exercise, they produce a specific substance known as mechano growth factor (MGF) that activates stem cells already present in the tissue. Once activated, these progenitor cells begin to divide, creating additional muscle fibres and increasing the size and strength of the muscle. In addition to intensive exercise, muscles need to be stimulated by growth hormone (GH) in order to release MGF. Since there is a natural decrease in the levels of this hormone as we age, this may combine with the lack of intensive physical activity to cause muscle wasting in elderly people. "The downside", warns Dr. Goldspink, "is that MGF has great potential for doping in sports. A synthetic version is already available over the internet, and although it is still very expensive, it is expected that new technologies will bring down the price to make it comparable to that of human insulin". The downside? I hear negativity coming from Dr. Goldspink when optimism seems more the order of the day. New ways for athletes to boost their performance? Don't we want them to improve? Don't we want continuous improvement leading to the perfection of human bodies? Aren't we hearing the march of transhumanist progress? Isn't progress good? Don't we need the prospect of stronger bodies to boost our spirits as Peak Oil approaches? My bottom line on drug doping by athletes: Why should we care? Why should we only want to see natural wild type bodies compete? That would be tantamount to saying that car races should only be done with standard mass produced factory cars. But we expect more from our race cars, much more. Why not expect more from humans? The way I see it: Some people get the luck of the genetic draw and have incredible athletic bodies. If lucky genetic naturals want to compete only with each other, fine. Have contests for genetic naturals. But why not other contests between those boosted athletes who can strut with the latest that biomedical science and technology have to offer?